Don't Miss Out Sponsoring the 2019 Washington Genealogy Genealogy Poster! Do you want to increase your company's or organization's visibility? Do you want to stand out from the crowd for fund raising? Business development? Candidate recruitment? If so, you don't want to miss out sponsoring the Washington Life Science Genealogy 2019 poster. Washington Life Science Genealogy, last published in 2015, is a one-of-a-kind image that will illustrate the "technology origins" of nearly 400 firms and non-profit research organizations located in the state. More than one-quarter of which are founded on technology transferred from the UW, WSU, the Hutch and others. More than thirty are new companies. 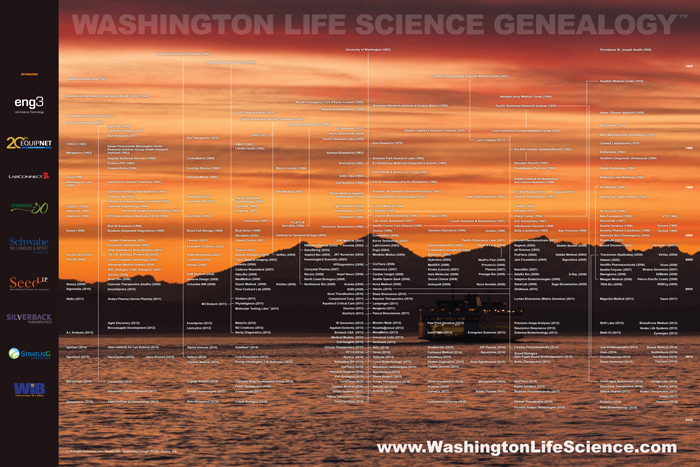 Washington Life Science Genealogy, unlike previous self-mailing brochures, will be published in a 2 ft. x 3 ft. varnished poster format, along with an updatable digital format for downloading. The printed posters will be distributed to all companies in the state of Washington, with the digital posters distributed to our growing database of U.S. and Canadian companies that includes: senior executives and management, VC firms, technology transfer officers, scientists, legislators, media, service sector, educators and others. Distribution of the Washington Life Science Genealogy and other posters will begin in the spring of 2019. Sponsorship start at just $500. If you want to sponsor the new Washington Life Science Genealogy poster, please e-mail: Sponsor@InfoResource.org specifying the sponsorship level you desire along with the billing contact name, mailing address, phone number, and contact e-mail. We hope you will join with us and take advantage of this very special sponsorship opportunity. If you have questions, please e-mail: Solutions@InfoResource.org. Please note that we accept American Express, MasterCard, and Visa for credit card payment. Washington Life Science Genealogy(TM) 2019 © Info.Resource, Inc.